Goto Googleplaystore for a fresh installation. Kindly note that i have tested it and it's working perfectly. Thank you. Visit the nearest Carlcare office to get an update that enable memory swap. Phil replied to Camon 11 Pro. Sorry about that. Please resetting your phone will restore it back to normal. Please try to report to the manager in charge. 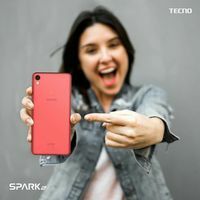 lummyfinest replied to Is it possible to change font on Tecno Spark 2 without rooting it?